For Colored Girls Who Have Considered Suicide/When the Rainbow is Enuf by Ntozake Shange is a vibrant tribute to the transitional power of the Black femme. The moment we step into the abandoned train station at Court Theatre, we know we are in a space full with the possibility of movement and growth. Directed by Seret Scott, who took over the role of Lady in Orange in the original Broadway production, this beautiful production moves with purpose. With the brilliant addition of the character of Lyric played by Melody Angel, it feels like For Colored Girls has taken a necessary step forward. This play used to saturate the American theatre scene, so much so that it is rarely produced now, much to the detriment of young Black femmes. In fact, me and the friend I brought to this exuberant opening at Court realized we had both been in the play (her in a regional production, myself in college) but never seen it. In a conversation after the show, I learned that Lyric is an addition to the play via Seret, who had discussed the idea with Shange before her passing. When asked what color she should be, Shange replied all of them. 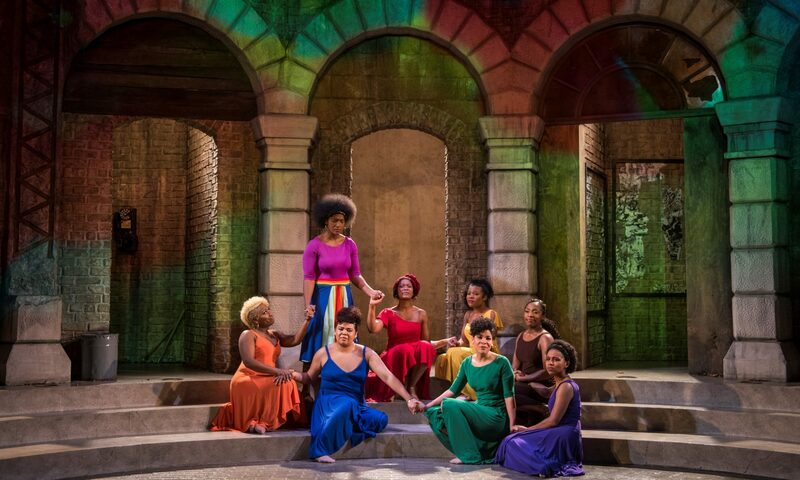 Costume Designer Samantha Jones does not disappoint, the dresses she designed for all of the femmes onstage are absolutely stunning, including Lyric’s multicolored confection. Each dress communicated the personality of the actor, which I think was wise considering that the anecdotes convey an arc but the narrative must be drawn by each performer. Shange’s script invites you to place yourself within it, to connect the dots of your own life, and this time the text felt like a classical play made new. Starting with the opening speech from Lady in Brown, a magnetic Patrese D. McClain, she draws us into the story driving on the beats coming from Melody Angel and the actors’ percussive moves. McClain’s delivery reminds me of a Shakespearean amphitheater, a troupe of actors ecstatic to share a story that has shaped them, and to make it our story too. Not to mention, their patty cake driven step-influenced dance sequence had the theatre jumping and the patrons hollering. The addition of the music and a narrator’s presence via Melody Angel’s Lyric is a strong choice, giving additional life to the pieces. We hear Smokey Robinson, and we hear Stay in my Corner backing the fun giggly story of Lady in Yellow (Melanie Brezill) as she teeters through the parking lot on the way to becoming. Melissa DuPrey as Lady in Blue has a fun dance break as Angel drums, and it allows the poetic language of what I consider one of the more difficult pieces in the play to flow naturally. It is aspirational thinking, but I would have loved to see DuPrey have a drum solo at some point during this production. This may be unfair however because DuPrey is also a captivating actress in addition to a musician. When she drops into her lower register to discuss the pain and loneliness of abortion in a single spotlight, she truly shines. It is a testament to Scott’s directing that all of these actresses feel as though they are in the same production, on the same journey, yet they all have vastly different levels of stage experience and are a very diverse group of people. Some are comedic actresses, some dancers, some are musicians, one is even a “seasoned triple threat” (gon’ head girl, I see you Alexis J. Roston). The choreography by Lady in Purple, Leah Casey, is simple and effective, ranging the spectrum of the diaspora. Step dance, African-inspired dance, and jazz are all utilized, the last specifically during Lady in Green (an effervescent Angelica Katie) and Lady in Purple’s piece about Sechita, where Green speaks and Purple dances the story. Casey’s dance loses structure throughout much like Sechita, yet ends with a powerful silhouette. This is a strong architectural choice that I think will grow through the direction of the run as she loses herself more and more to the piece. As many who are familiar with this show will know, much like a Black femme’s life the play is peppered with pain that Scott introduces in a jarring way, emulating how one of these events would drop in your life. Anji White as Lady in Red carries much of the emotional depth of the show, and does so with aplomb, grace, and power. In a stunning reveal, Jones, White and Scott show us the protections we put on as Black femmes, and interrogates the ways in which we cover ourselves even among our own people. Every interpretation of these characters is true and real and valid, and feels based in the nature of the performers. Lady in Orange (Alexis J. Roston) and Lady in Green are hilarious and defiant. Lady in Purple (Leah Casey) is a little nerdy (a choice I personally loved) and painfully wonders why she has not been offered love. In a wonderful collaboration of lights (Paul Toben) and sound (Andre Pluess), police presence is inferred without taking over the narrative, illustrating the timelessness of our story. Anji White’s final piece is astounding in its clarity and in its pain. Scored like a piece of music, supported by each of these phenomenal actors, White performs the Herculean feat that is the final monologue about Beau Willie Brown with a rare dexterity and strength. In Court’s production of For Colored Girls Who Have Considered Suicide/When the Rainbow is Enuf Scott has gifted her legacy to a new generation of skilled performers. It is beautiful, it is reverent, it is painful, it is us. Scott called Shange into the space in a beautiful and simple tribute that brought tears to my eyes. Run, don’t walk to see For Colored Girls. For Colored Girls Who Have Considered Suicide/When the Rainbow is Enuf runs at Court Theatre through April 14th. Bias Alert: Regina Victor is an Artistic Associate at Sideshow Theatre with Melissa DuPrey, and dramaturg’d To Catch a Fish at Timeline in 2018, in which Anji White appeared. Samantha C. Jones costume designed Breach at Victory Gardens, which Victor assistant directed.